New year, New start! Now is the time to make the move, take action, get out of your comfort zone and try something different! 1 A warm friendly welcoming positive atmosphere awaits you! 2 At our club your always more than just an anonymous number, your part of a dedicated family and our service to you doesn’t end once your through the door! All students are familiar both to the instructor and others on a name level. 3 You receive lots of individual personalized attention, this is crucial for proper development in the martial arts as teaching that is only aimed at the group level alone is not enough! With Brazilian Jiu-Jitsu You get Health Benefits, Fitness, Weight Loss, Self Defence Ability, Stress Relief, Improved Well Being & Mood, You Feel More Positive, You Develop Strength & Discipline Both Physically & Mentally, You Start to Eat Better and Make Healthier More Positive Lifestyle Choices and its Fun to do as well as Interesting, You also meet lots of New People and get to Socialise! Way better than a gym membership you will be bored of by February! Its suitable for anyone from 14yrs up to any age! No previous fitness or experience at all is needed and you don’t need to be in good shape, all you have to do is send a message and we will take care of the rest! Making the Decision to join will be the best one you ever make! 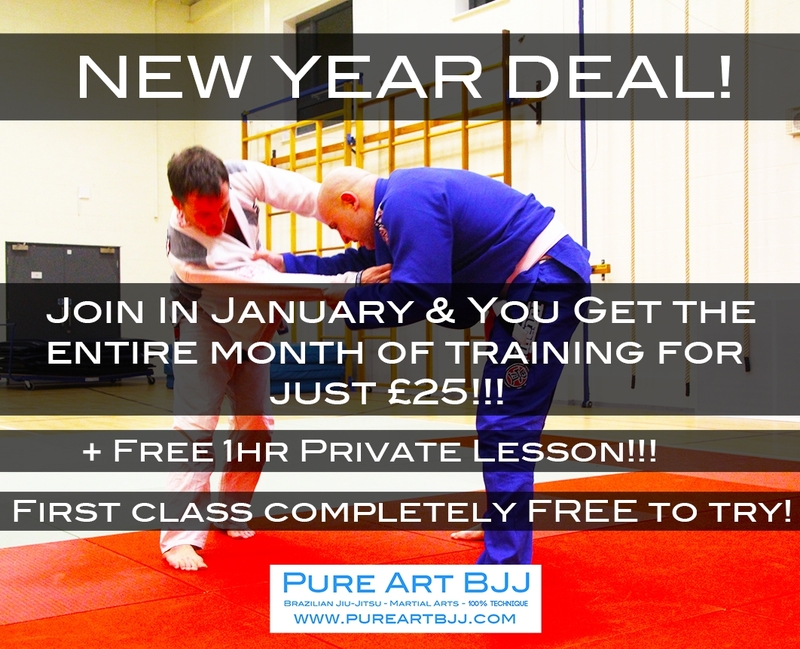 This entry was posted in Class Information, Special Offers and tagged BJJ Portsmouth, Brazilian Jiu-Jitsu Portsmouth, New Year Deal, Special Offer by Adam Sparrow BJJ. Bookmark the permalink.